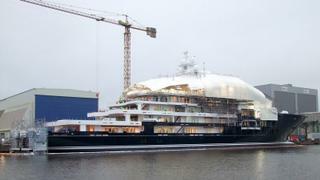 Two of Northern Europe’s biggest shipyards will collaborate on a new 100 metre explorer yacht, it has been revealed. Norwegian commercial yard Kleven made the announcement earlier this week (November 14) that it has signed a contract with Lürssen to deliver the vessel to a “non-disclosed customer”. The as-yet-unnamed explorer yacht will be built, partly outfitted and technically finalised at Kleven’s Norwegian facility before being transported to Lürssen’s Blohm+Voss yard in Hamburg for final outfitting. Ståle Rasmussen, CEO of Kleven, said: “With their more than 140 years of history in the luxury yacht business, Lürssen is unrivalled in its experience and knowledge, and we are proud of the fact that they have chosen Kleven as their long-term partner. “Kleven will be leaning heavily on expertise derived from building highly advanced, world class offshore vessels. We hope this is the first of many vessels being built in this partnership,” he added. Further details are few and far between at this stage, with the designers, accommodation, performance and delivery date all undisclosed. However, this development builds on a growing trend within the explorer yacht segment for working with commercial yards. Piriou, Vard and Ulstein Werft have all signed projects to build large explorer yachts in recent years. 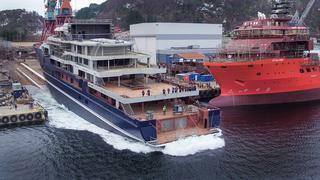 Meanwhile Kleven has already built two yachts over 100 metres, including the 116 metre Ulysses (pictured below), which is currently nearing completion in Germany. The news comes two months after it was announced that Lürssen Group was part of a consortium of investors who have bought a 40% share in Kleven for 300million NOK (roughly £27million).